Ukraine has a number of rather interesting ethnographical outdoor expositions telling us about Ukrainian history, traditions and culture. Visiting such museums you have a unique opportunity to plunge into the past and to feel it with your own hands. The Kiev Museum under the open air in Pirogovo is the most famous in Ukraine. Besides it is the largest museum of this kind in Europe (300 exhibits on the area of 150 ha). Each exposition displays national architecture and way of life of certain regions in Ukraine. There is also a mountain with windmills “soaring” above the Field of Handicrafts. During the holidays different festivities take place on the Field with music, dancing, skating and the most tasty food on the tables in the birch grove. Here you can purchase items made by contemporary craftsmen made right on the spot with the help of instruments which look as if they had been borrowed from the museum. A place where another ethnographical museum of Ukraine is situated is Lviv. In the 18th century this territory belonged to the mayor of the city Lionshan. In 1780 the emperor Joseph II visited this place and enjoyed the picturesque estate very much. In honor of the visit of the distinguished guest the owner named his estate Kaiserwald – the Tsar's forest. After the World War I luxurious villas were constructed here and so the Professorskaya Colony emerged. And in 1972 there were built 124 wood structures stretching for 60 ha among the beech trees, larches and fir-trees: houses, churches, threshing barns of Guzuls, Lemkis, Boykos and other local ethnical groups – all make up the museum of national architecture and way of life. Nowadays in all tourguides it is called “the Shevchenkivskyi Hai”. Other constructions include izbas (peasants’ log huts). The oldest were built in 1749, 1792, 1812, 1860, 1887 years. 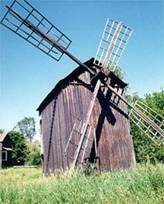 You can also see watermills, windmills, fulling mills, tartak sawmill, smitheries. And inside all these large and small houses there are 20 thousand household items and pieces of artwork. The museum is very proud of its 6 wooden churches. The museum of national architecture in Uzhgorod is a small village in the centre of the ancient European city. Here you can enjoy wooden houses brought here from different parts of the country which look great on the background of the walls of an ancient castle. The layout of the museum resembles the map of the Transcarpathian region. And the most impressive thing about this village is that it is still inhabited. Sheep are still peacefully gazing here, hens with beautiful coloring hens are walking around and frogs are croaking merrily around a pretty pond with water lilies. Severe and manly beauty of the mountainous region is reflected in the framework of the houses, made up of massive beams. The paths are winding through the yards with wooden benches. And in the yard of one of the houses there is a space-like construction weaved from willow. An unbelievable basket, which can contain 5 people, but it is used for … storing corn ears! The church of the 18th century, as if webbed from wooden lace, has a bell which unhurriedly measures time. The museum-reserve in Chernovtsy, situated on the slopes of a picturesque ravine has 30 houses, two windmills, a tavern, two smitheries and wonderful churches. These wooden churches – are “visiting cards”, with the help of which you can easily study geography and history of Ukraine. The tiny St. Nicholas’s Church is built from smereka. This church is of a “hut-type”, typical for Bukovina under the sway of Ottoman (16th – 19th centuries). At that time it was prohibited for the Christians to construct high churches. That’s why among the village huts another one was built, which in the outward appearance did not anyhow differ from the others and only a cross on the roof marked it out from the ordinary dwelling constructions. Inside the church there is an impressive collection of naïve sacral art – icons of the “Bukovina primitive art”. Behind the church there is a construction with a strange name “primaria” – a village board with gendarmerie. At Christmas and Ivana Kupala (Midsummer Day) the owners of the museums and tourists have fun here, making the deserted streets of the village-museum lively, but only for several days. In the Rokini village, 10 km away from Lutsk there is another wonderful museum. The street named after the composer Shopen leads to it. 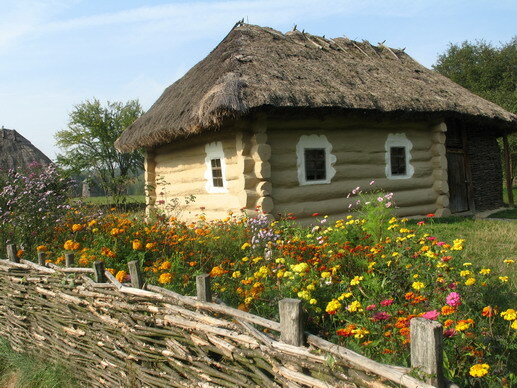 The Museum of Agricultural Histiry of Volyn is situated on the Shkolnaya Street. Around the windmill there is a white flock of wattle houses (masanka), brought here from the nearby villages. It seems to be a bit offensive, that these clean tiny houses are called “hen houses”. There is a cattleshed, a hen house, a well and a wicker lath fence with a stile. And, as in any other museum, there are plates next to each exhibit. 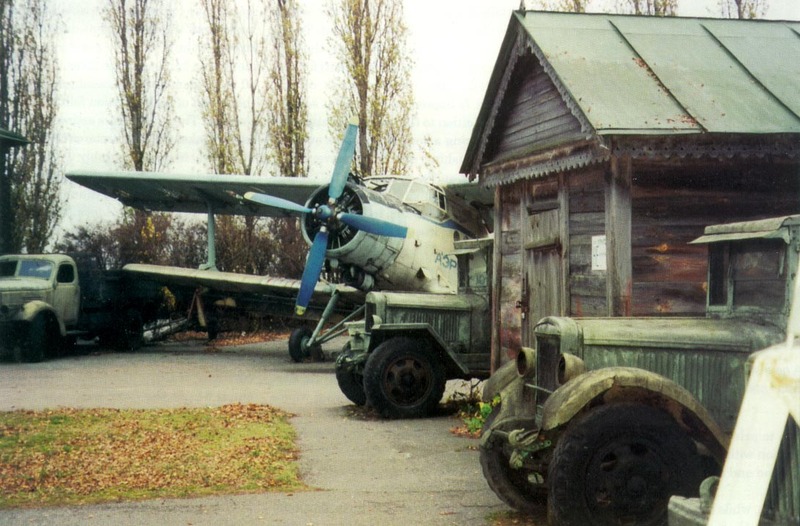 Not far from the city of Prereyaslav-Khmelnitski, on the by-pass road there is a sign “Museum”. From this place you can see a wonderful panorama of a unique ensemble, founded 40 years ago. On the area of 3 ha peacefully exist museums of history of the orthodox church and space, of towels and land transport, museums of bread, bee-farming, rites and Sholom Aleihem. This distinctive ensemble of 30 museums includes also 5 churches, a bell tower, windmills, artificial groves and lakes, dendrological zoo, stone sculptures of Ukrainian steppes, lodge of the count Horchakov and Cossack lodgement. It seems that time stopped here several times. And in the estates there are still those well-attended gardens and beautiful flowerbeds. Petrykivka – is a village and a district centre (in ), situated on the shores of the river Chaplinka. It was founded in 1756. At the beginning of the 19th century artistic weaving begins to develop here. Carpets, belts, plahtas of the local craftsmen are soon becoming very popular. 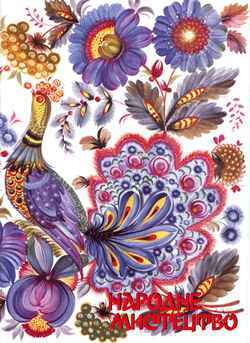 During the next century a special petrikivskyi ornament was formed, based mostly on the plant-animal motives and was used in paintings, embroidery, and prints. External and internal walls of the houses were painted with colorful ornaments using homemade vegetable paint, colorful clay, chalk and soot. Gradually the creative work of Petrykivka-artists became more professional, and the village turned into one of the centers of Ukrainian embroidery. Souvenirs, manufactured at the factory “Druzhba”, founded in 1961 became popular not only in the USSR, but also abroad. Nowadays in Petrykivka there is an active museum of national art. Its exposition includes numerous masterpieces of ethnic art. These are pictures, painted household items, decorations. There are also workshops, where you can not only watch the artists at work, but also to try your hand at drawing in a petrykivka style. And definitely various souveniers are sold here. The craftsmen also draw the greeting cards with great pleasure and paint decorations individually for everybody who wishes. 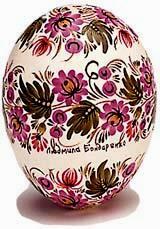 The petrykivska art is known all over the world together with hohloma. This type of art is studied in many art schools, competitions are held and textbooks on painting techniques are created. 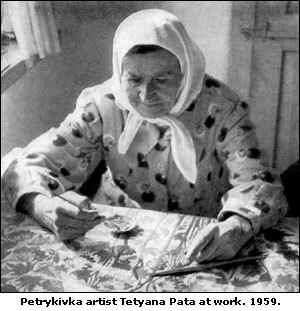 Tetyana Pata (1884–1976), one of the outstanding representatives of the Petrykivka decorative style of painting, was born and spent all her life in Petrykivka village (Photo taken from the Welcome to Ukraine site).